Planning as an ongoing process, where a decision at each step helps clarify your choices in the next step. You can use the suggested questions after each step to help define the details for each task. The effective use of planning will do more than any other competency to advance both getting the job done and keeping the group together. It is an “umbrella” competency in its effect on a variety of issues. Planning is useful both in group situations and one-on-one. 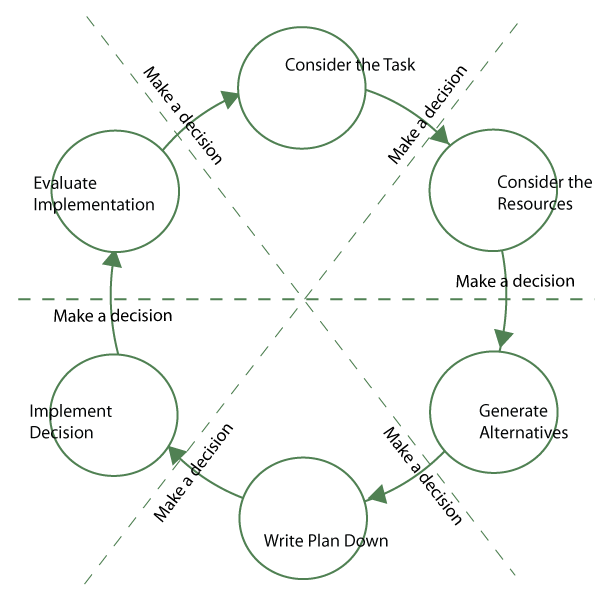 Planning is a “core competency.” It offers a general conceptual framework to integrate a variety of related skills, including problem-solving, scheduling, time management, performance appraisal, negotiation, and conflict resolution. Along with Evaluation and Manager of Learning, Planning is one of the most critical and complex competencies that you can master. Skilled use of this competency helps you get the job done and keep the group together in all kinds of situations. The goal of planning is to improve the quality of the decisions made and the results achieved. By following a proven planning structure, you can improve the number and quality of options available to you at each step of the process. This produces improved outcomes. When you engage in a structured decision-making process, you are more confident about the information you gather and the decision you make based on that information. Your clarity of judgment is improved and can make firm decisions with fewer chances that you will second-guess yourself later on. Reach group agreement on the nature of the task and commitment to resolve it. Identify internal and external constraints and support for the issue. The purpose of the second step of Planning, consider the resources, is to determine the time, physical, and human resources available to the group. Examine as many alternative solutions or responses to a problem or situation as possible. Create a variety of ideas and systematically evaluate them. Gain input from all team members and their commitment to an eventual solution. Obtain members’ commitment to a solution. Analyze all of the information gathered and choose the best solution. The purpose of the fifth step of Planning, evaluation, is to look at what happened and pass on what we learned to our group and to other groups. Using specified skills to identify the nature of a given situation or task. Applying guidelines for analyzing a task or problem in order to solve it. Along with Evaluation and Manager of Learning, this competency is one of the most critical and complex in leadership development. Skilled use of this competency positively influences the leader's ability to get the job done and keep the group together in all kinds of situations.